Making Pippen Hill was far more fun than should be allowed for a job. Almost everything we did was with new materials and methods, but the design was pliable, and organic, inviting experimentation. 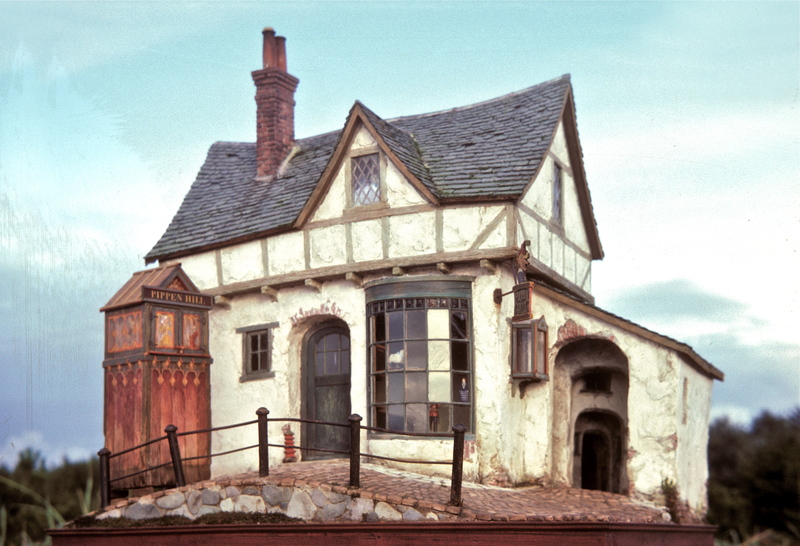 A house and shop for a puppet maker (as well as the customer, a highly imaginative doll-maker)—it was a storybook house, childlike in feel, with very little predetermined. As usual, we made it up as we went along, taking out what didn’t work, and sailing along on what did. A major element was the use of false perspective, to give the feeling of greater space and depth. For the front, we wanted the feeling of seeing the building from a distance, which is why we made the humpy little hill for the puppet theater. 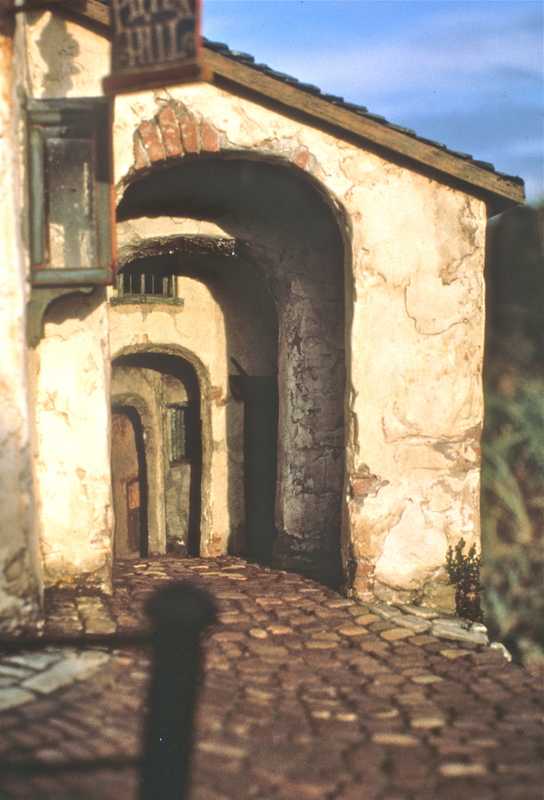 Plus, Noel designed that alleyway to give the feeling of depth and mystery—where did that alleyway lead? A reader has asked if we used a specific angle, or laid out the vanishing point on paper for that alley. Not exactly. Noel and I have an aversion to math, and our mathematical attempts got in the way of our miniatures work far more than they helped. We worked best in eyeball geometry. I believe the alley was around 7” deep. It was open at the front and dead-ended into a wall at the back of the project. It was also on a curve. Noel built a series of archways in descending sizes (whatever looked right) leading to the back. Then he added a door at the back the smallest size he thought he could get away with. I should mention here that he has a natural sense of where a focal point would be—a talent he developed in art school (half a century ago!). What you probably can’t see in the photo is a tiny upper window to the right at the back, before the door. A window where a light shines (if the bulb hasn’t burned out). It was my job to pave from front to back in the right perspective. I paved the front sidewalk first, getting a feel for the bricks, and how to make the sidewalk feel deeper than it was. I think I used Mini Brick & Stone’s plaster-like bricks, in various colors, for both the pavers (at the edges), and the stones. Once soaked in water they were easily carved with pliers and an Exacto knife into the sizes and shapes I needed. When I got to the alley entrance I stopped to make s few stones that looked right in relation to the door at the back. Once I determined my final smallest size, I started again at the entrance and worked my way gradually back. It was one of those jobs that took over—once I got the feel for it, the stones, or the stone people, told me what to do. The best response to the alley was from our friend Chris, who stopped at the house to see the project, an Englishwoman as it happened. After looking at the alley for a few minutes, she went around to the back (the open side) of the project, expecting to see more alley. She let out a little yell—“where did it go?!”. 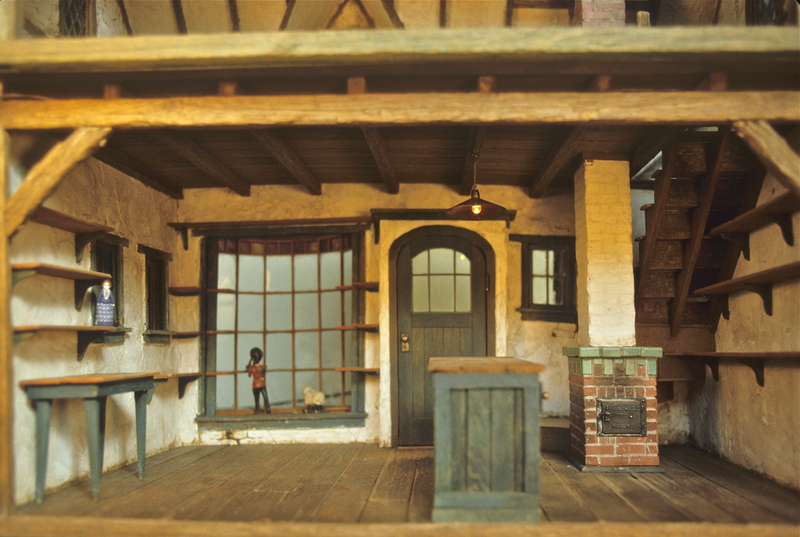 Of course at the back the alley didn’t exist—we were back to real-time 1/12th scale for the interior. What would have been the continuing alley was a wall. The alley is part real and part imagination. A matter of perspective. For the life of me, I can’t remember what was on that back wall. Another matter of perspective is my storytelling nature. While I stick to the truth, as I remember it, in these postings, my writing mind also likes to frame it all in a good read. As in, those probably weren’t Chris’s exact words, but the feeling. As I recall. 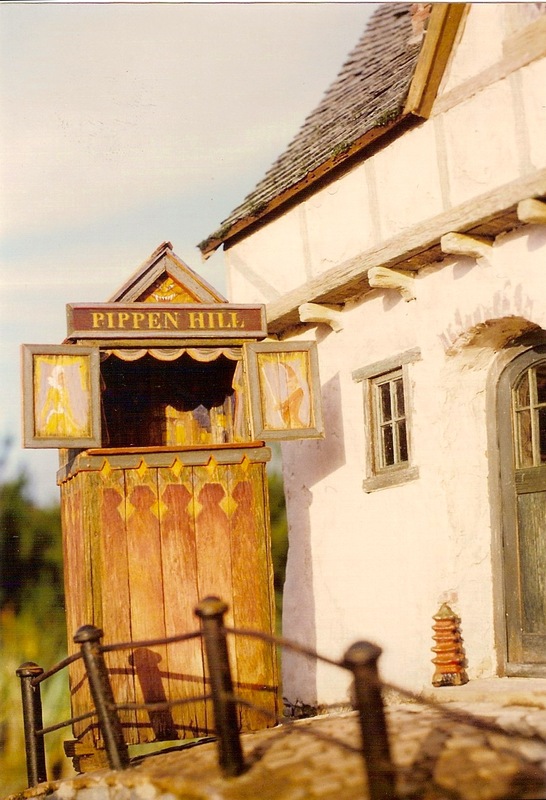 I say this in partial apology and partial explanation, because a reader noted that in the last posting I incorrectly attributed the puppet-maker doll to Renee Delaney, who commissioned Pippen Hill. She was right—the doll was made by Arlyn Coad, a talented Canadian puppeteer and doll-maker, and that should be noted (I have corrected the blog). I should have remembered, but I didn’t, so I thank you for setting me straight. Renee sent me the correct information, and, after reading the blog, noted my memory was different from hers as to the where’s and how’s of the commission. In many ways. So, I confess to taking some, or a great deal of, artistic license in this history of our work. I hope the entertainment value is worth the rubber-banding of the “truth.” At least you know the photos are the unenhanced, true record of our work, as my right-brained mind will never be able to figure out how to use Photoshop. 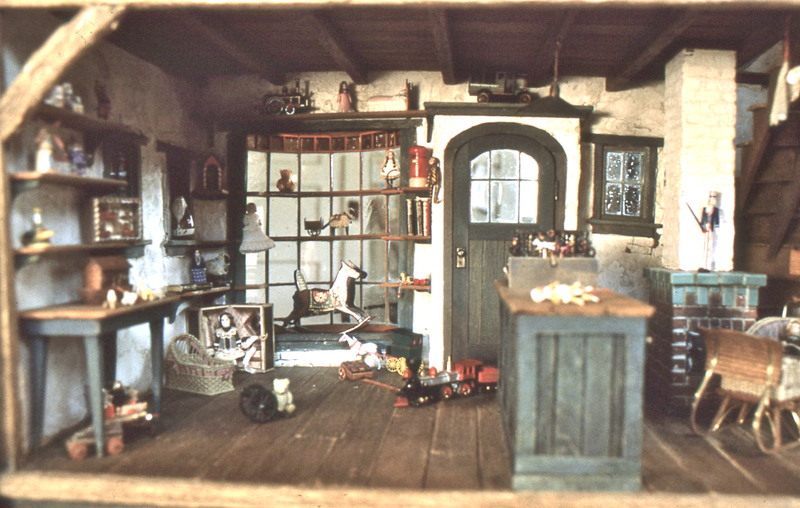 This entry was posted in Houses, Memoir, Miniatures and tagged architecture, arts, dollhouses, miniatures. Bookmark the permalink. Thank you. The story’s the thing! Glad to hear you enjoy reading it. Thanks, Barbara–those Guild School years were great! It is hard to write a comment because have so many questions. So I will limit it to two. 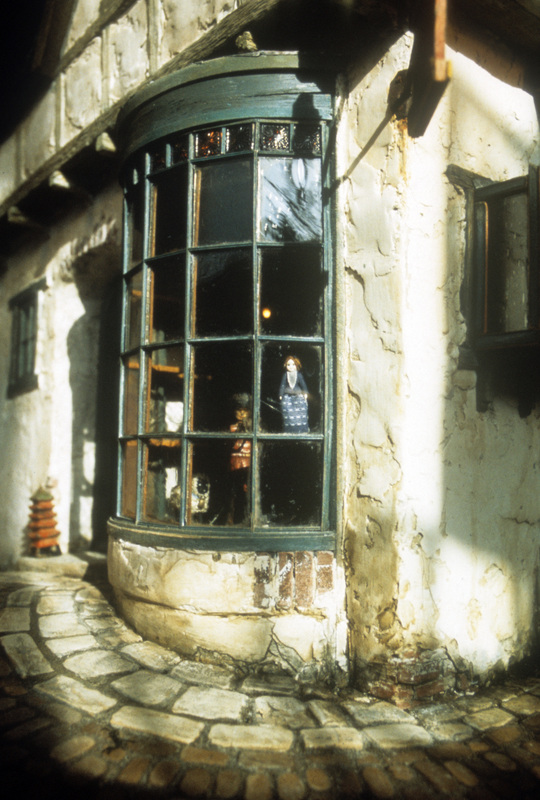 Did you use real glass in the windows? I am curious about how the roof was built. All I can figure out is, uneven trusses were necessary to achieve the wonky roof line. 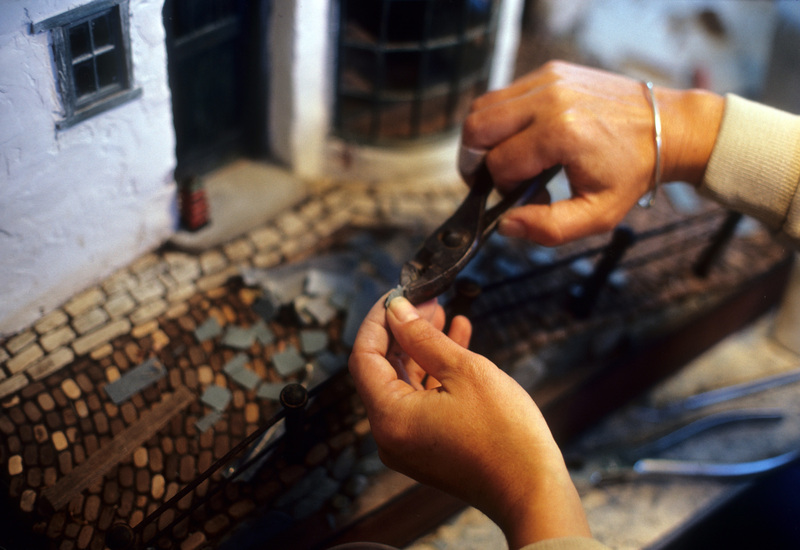 Yes, it’s real glass–a poured clear glass, a little crackly looking, used for accents in stained glass windows. The upper panes in the bow window were cut from a purple-ish, patterned pressed glass tile–each little square a perfect size for a pane. They were built into basswood channeling, over a bow-shaped form, then aged to look like lead. The roof slates were cut to size by Jack Blackham, painstakingly, I might add. Then I shaped them to fit and made the edges ragged with needle-nose pliers. And yes, the roof shape was built into the project from the bottom up, trusses and all. Can’t remember if it was doorskin or thinner model airplane ply we laid over the trusses. Happy to help. I can’t fit it all in the individual posts. Thanks, it was a fun ride, the whole thing. I have enjoyed your articles in NN for years and always yearned to take a class. I dream when I look at your pictures and am inspired to work on my miniatures again as much as my hands will allow since I have Lupus and can’t work as small anymore. Thank you so much for answering questions on your blog too! Judy p.s. I enjoy having 2 of Noel’s garbage cans. Thank you, Judy, and I’m glad you’re enjoying your garbage cans!